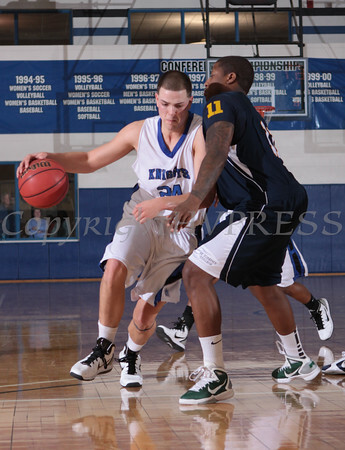 Mount Saint Mary College's Tim Morris (24) drives past defender Trevor Stanley (11) on Saturday, February 19, 2011 inside the Kaplan Center in Newburgh, NY. St. Joseph's College defeated the Mount 75-69. Hudson Valley Press/CHUCK STEWART, JR.